For the past two months I have been covering a camping trip my family took way back in July. We spent five days camping in northern Wisconsin and we explored several different state parks and waterfalls. We also took a trip up to Michigan's Upper Peninsula to view some of their amazing waterfalls. 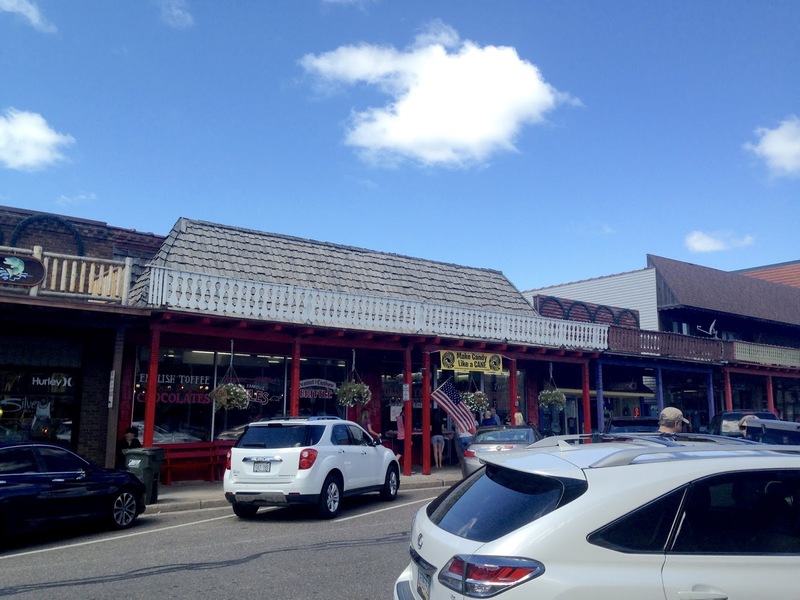 And on our last day of our camping trip, we spent the day exploring the cute towns of Ashland and Bayfield. If you missed any of these posts, they all began HERE and were posted every Wednesday thereafter. Today's post will conclude this series, and next week I will be moving on to other little trips my husband and I have taken during the year. I don't plan on taking anymore big trips until May and August, so the rest of my travel posts for the year will be little ones, like today's post! But that's OK, because life really isn't about big vacations, but all the small, fun activities we do with our families...isn't it? The very last day of our camping trip was a day spent cleaning up the camp site, packing up, and heading home. This is usually a day most campers regret, but we had something very special to look forward too...picking up our new kitten Jackson from the shelter! You will read more about that at the bottom of this post, for now, lets talk about Hayward! The drive home from our campground to our home was about three hours. We had some time to kill before our appointment to pick up Jackson, so we decided to stop and stretch our legs in Hayward, which was only about an hour from our campsite. I had never been to Hayward before, and I was quite surprised at what a cute town it was! 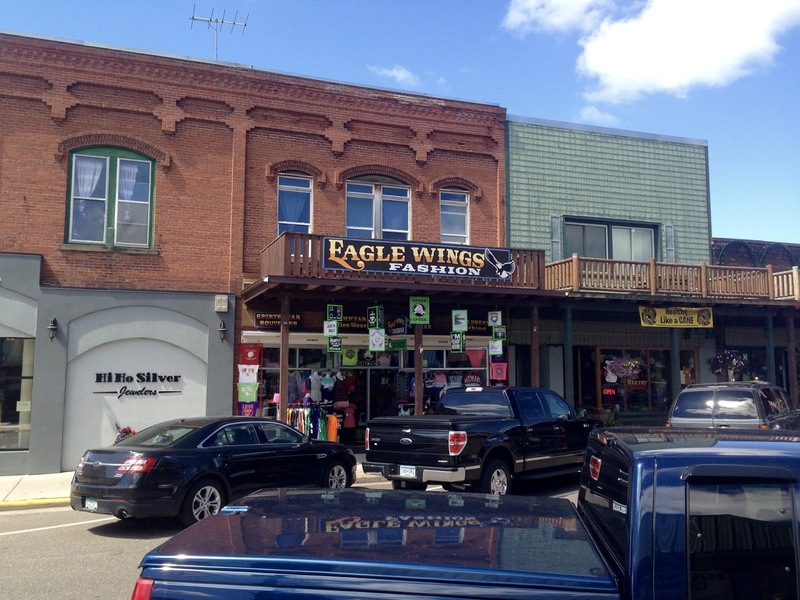 Now even though Hayward is in northern Wisconsin, it reminded me of a western town with its architecture and decor. 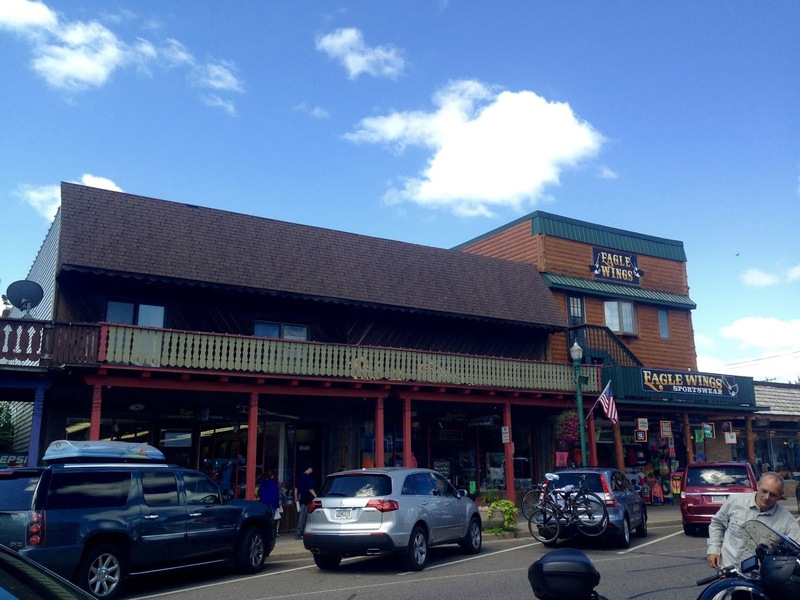 Hayward is a former lumbering town and they host the Lumberjack World Championships every summer. 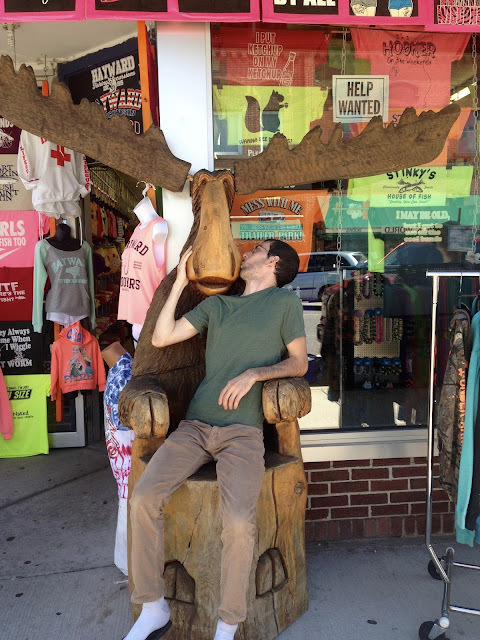 I wonder if that's where this moose came from? Don't mind my son Jordan, he's just being silly! The porch overhangs with the wooden beams really were reminiscent of towns out west I had seen. We stopped in this candy shoppe and it was one of the best candy stores I had ever been in. The prices were actually affordable, and the chocolate was delicious! You can even watch them make their candy creations through a window! When we were there they had chocolate covered strawberries and chocolate covered pretzels on special...so we bought a ton! It's called Tremblay's Sweet Shop. We basically just walked up and down these cute streets admiring all the buildings. Jason and I did stop at the coffee shop to pick up some brew....cute coffee shops are a must when visiting any small town! My boys sure had fun with all the carved log statues. Although Hayward was once known as a lumberjack town, it is now known for its fishing because there are many lakes in the area known for their trophy winning muskies. After our brief visit to Hayward, it was finally time to head to the shelter and bring the newest member of our family home. Six months ago we brought our sweet Jackson into our lives. Little did I know then how much joy and love he would bring into our lives. He has filled a part of my life, I didn't even know was empty. I'm so happy we found him, and I don't feel as if I rescued him, but he is the one who rescued me. This is what Jackson looked like at eight weeks when we picked him up at the shelter. I look at these pictures now and I can't believe how much he has grown in such a short time. And this is what Jackson looks like today. He is the happiest, sweetest, most affectionate kitty I have ever known. He and I have our little routine. I sit on this couch and work on my computer every morning. Jackson either sits on my lap or on this white blanket right next to me. I call Jackson my shadow, for wherever I am, he is. He follows me from room to room every day. 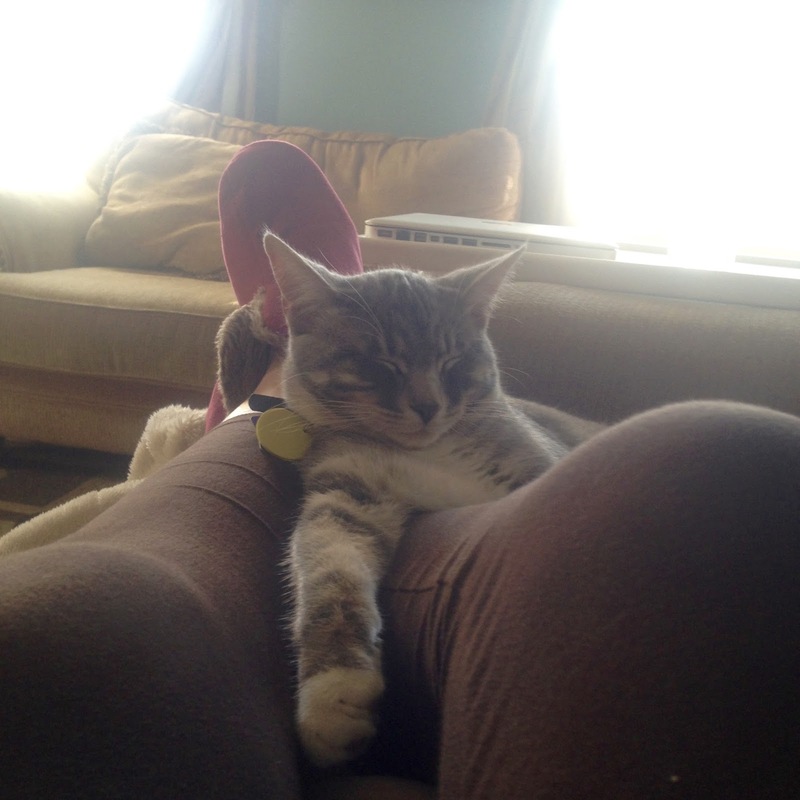 Here he is sleeping on my legs as I relax for the evening. 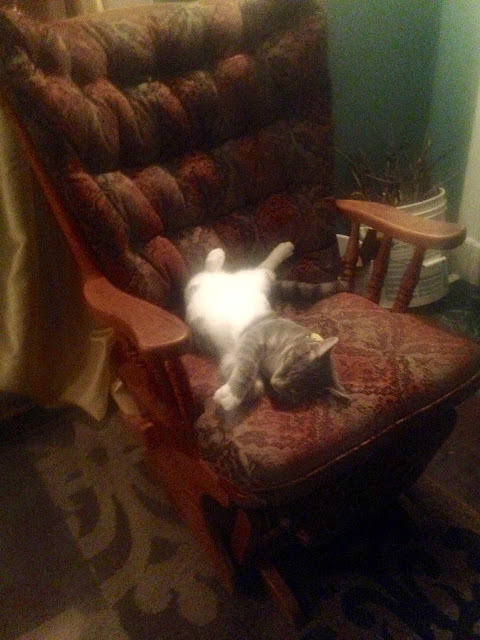 Jackson's other favorite sleeping spots in the house is this glider rocker for it's right next to the wood stove. He cracks me up with all his dramatic sleeping positions. I think the small vacations are the best!! And Jackson looks like such a dear. Don't they just make you feel all warm inside? Thanks Jodie. Yes, I just look at Jackson and melt! Looks like much to see! Yes there was! I wish we had more time to spend there. 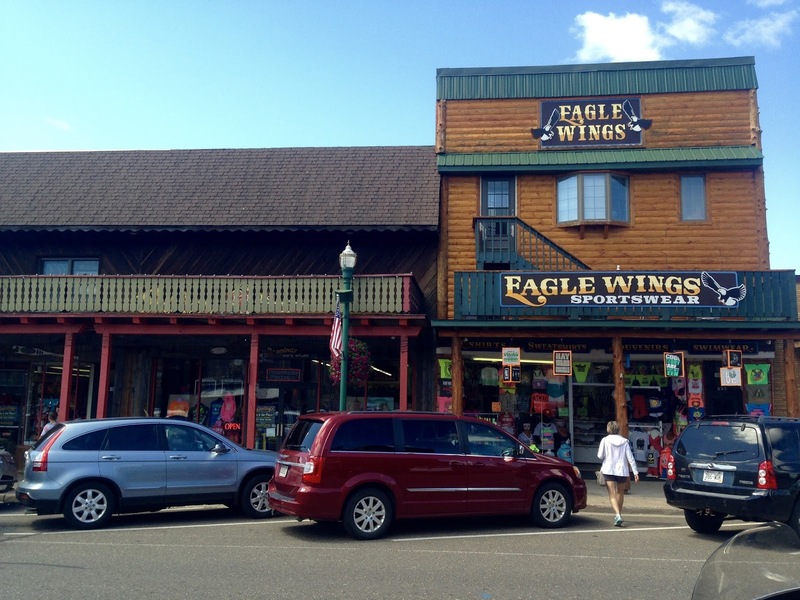 Looks like a cute little town and I definitely would have thought "old western town" with all the wood and beams and carvings. Those carved log statues are a riot! Lol! 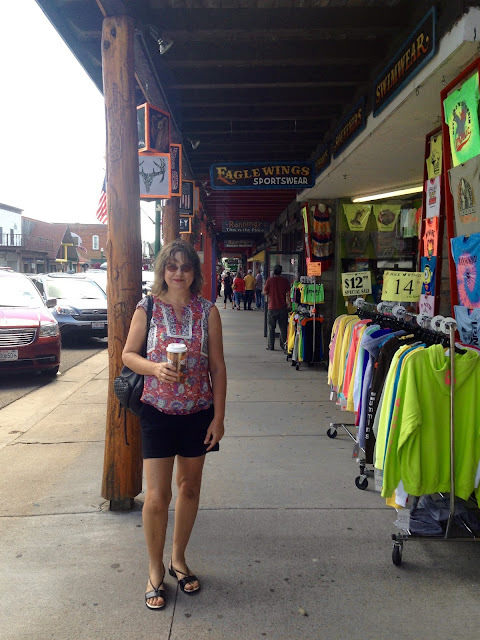 I love stopping in quaint coffee shops, too! I know they are so funny aren't they? That does look like a really cute town! Jackson looks so happy and content! Yes, cats have the weirdest sleeping positions, so funny to watch! Thanks Elli! Jackson's sleeping positions crack me up all the time! My sweet kitty! Can't wait to see him! I'm anxious to see how he reacts to you guys! 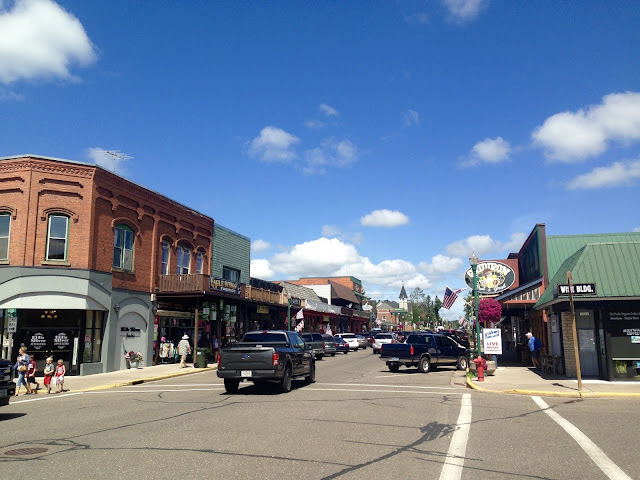 I loved small towns such this when we visited the USA! Enjoyed your entry once again, Amy. Thank you for linking up with the Travel Tuesday meme, hope to see you again there this week.